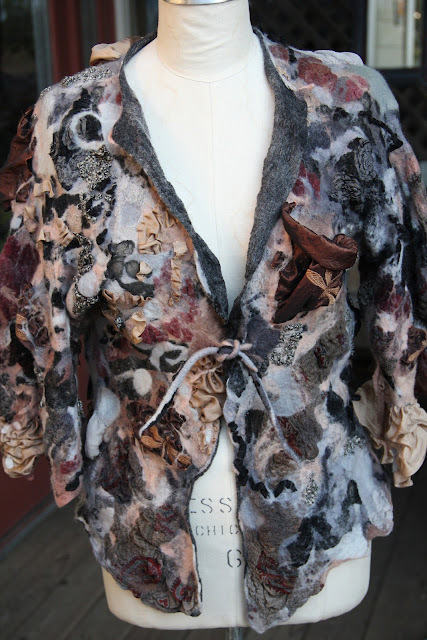 This nuno felted collage jacket was quite the undertaking but I am pleased with the results. It's reversible and looks great on either side. 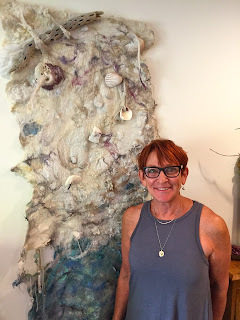 I dyed all of the wool roving and a lot of the silks used in the project. 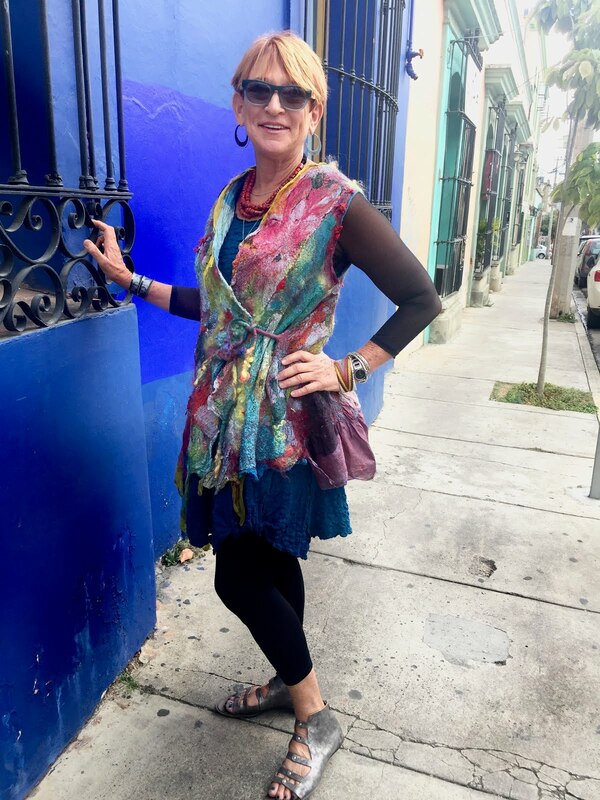 It's an upcycled garment for sure since it includes fabric from cast away clothing, ties, a vintage obi and recycled sari ribbons. 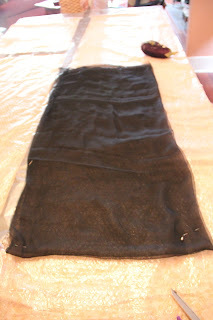 The front and back are made in one piece from a piece of black silk chiffon 78" long by 39" wide. 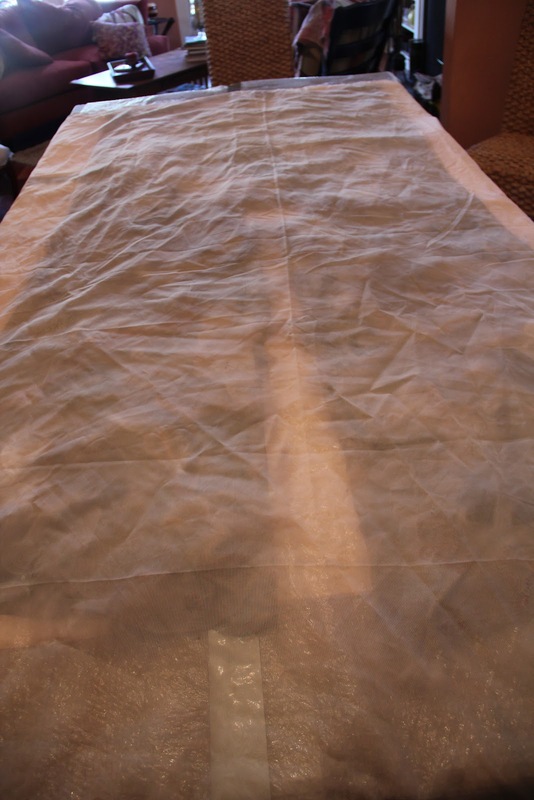 I folded the fabric in half lengthwise and then again horizontally from the folded edge. I cut the neck opening from the folded corner. 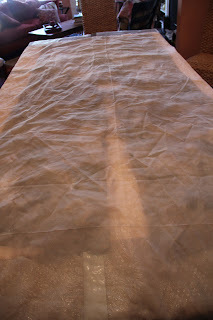 I then opened up the fabric, laid it flat and cut all the way down to make a front opening. 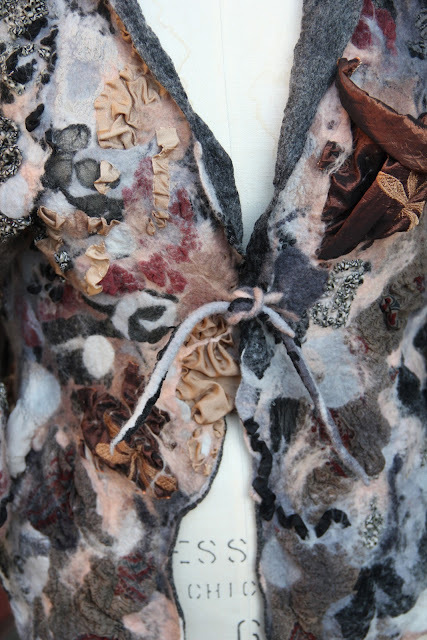 I then made a collage of my wool roving and fabrics. 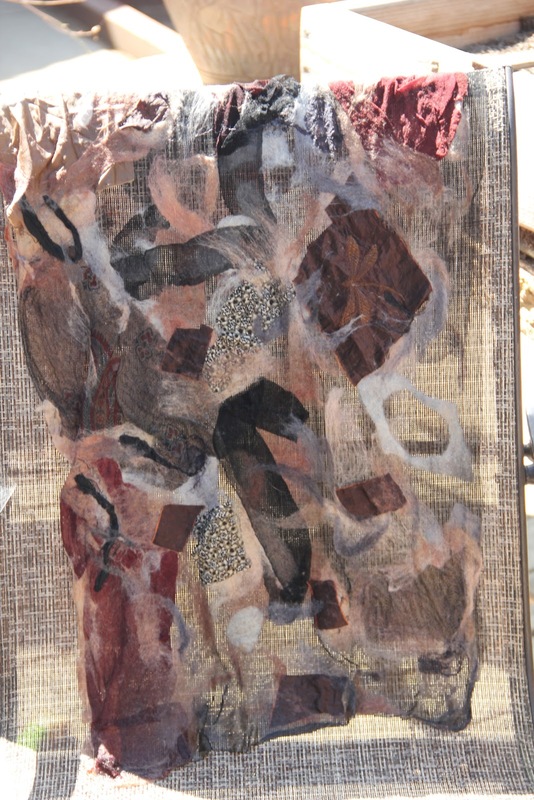 I covered up the collage with a cloth and then wet down the whole package with cool, soapy water. 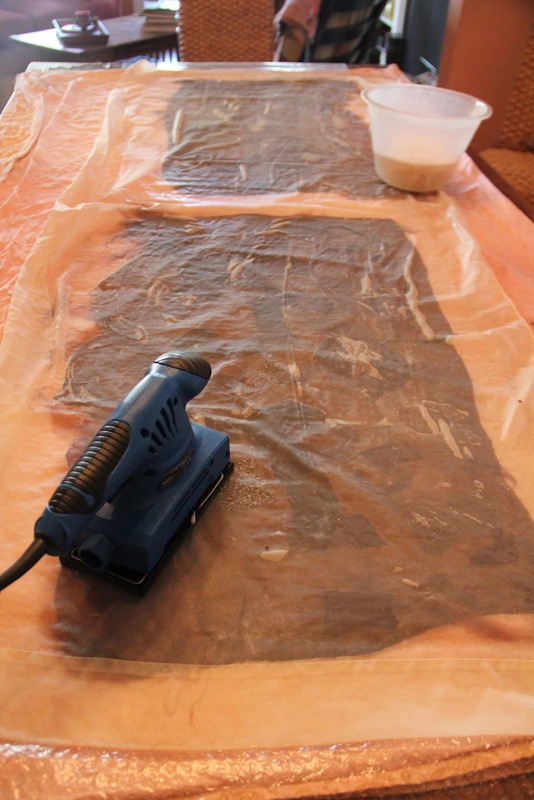 I used an electric sander to get the wool to adhere to the silk fabric. Once the fibers got to the pre felt stage, I took it out side to dry. I then started the sleeves by cutting two pieces from the black silk chiffon each 36" wide by 18" long. 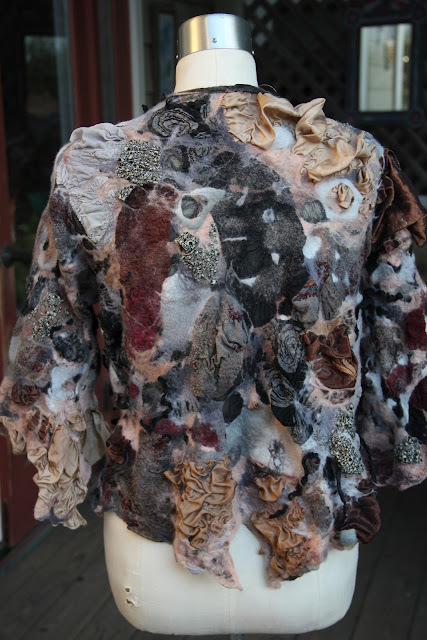 I prefelted the sleeves just like I did the body. I put the sleeves outside to dry with the body. 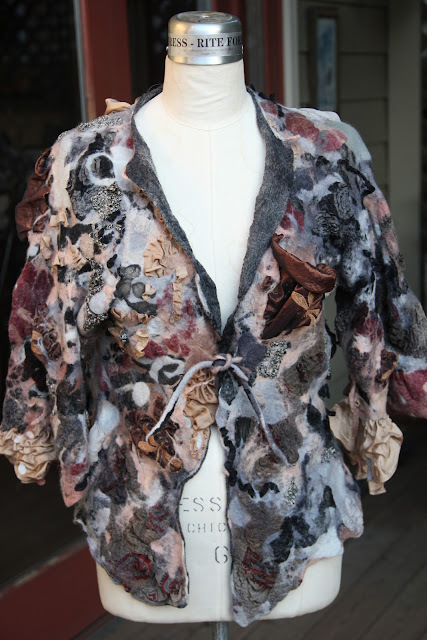 Once the pieces were all dry, I sewed the sleeves to the body, wrong sides together. I then stitched the front to the back, wrong sides together. That's all the sewing there is on this project. I covered up the seams with more wool roving. Wet it out and again used the sander. I put plastic in the sleeves to assure that they did not felt together. 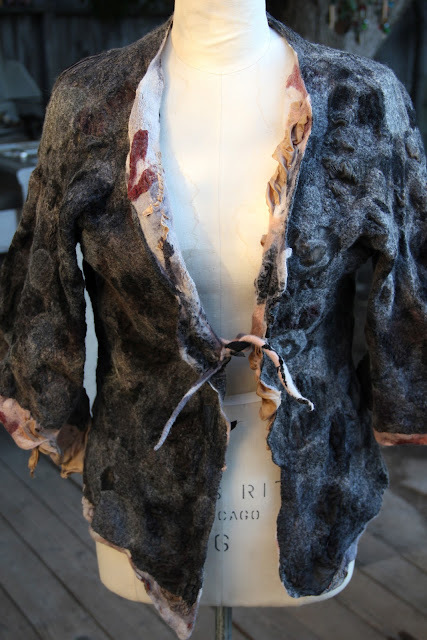 I added a little wabi sabi by placing a piece of red velvet inside the jacket and felting it in. 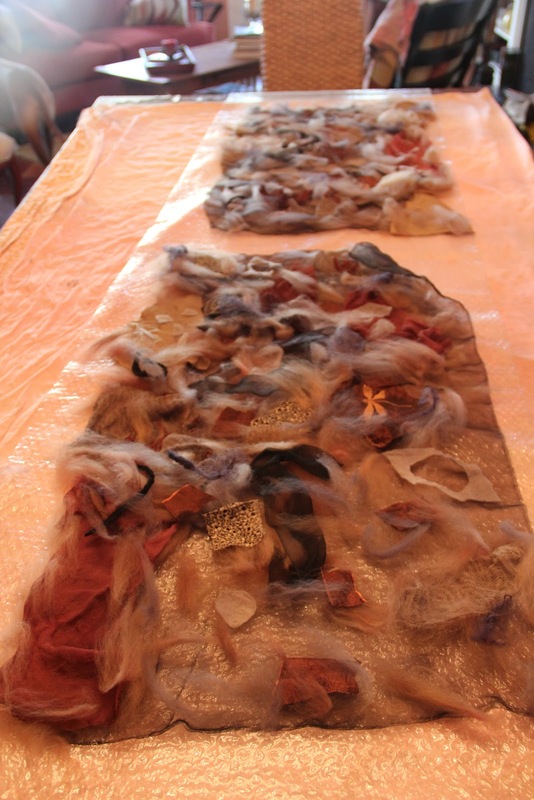 And now for the fun part - the slamming session to felt and full the piece. Hot water, soap and slam away! I do this in my kitchen sink. It's reversible too and looks great on either side. Hi! what type of sander did you use, and what pad (mine is velcro) also i have an orbital sander but have heard that you cannot use it?